Hyperloop is a technology to move people or things anywhere in the world quickly, safely, efficiently, on-demand and with minimal impact to the environment. The technology was reintroduced and updated by Elon Musk (Tesla and SpaceX). The system uses electric propulsion to accelerate a passenger or cargo vehicle through a tube in a low pressure environment. The autonomous vehicle levitates slightly above the track and glides at faster-than-airline speeds over long distances. Direct emissions, noise, delay, weather concerns and pilot error are eliminated. This could be a giant step in transportation. Hyperloop is no longer science fiction as Hyperloop is now aiming to demonstrate a full-scale, high-speed test of its track, vehicle and controlled-environment tube in late 2016 or early 2017. This bold vision may become reality thanks to a proposed Hyperloop link between the two capital cities which is estimated to bring annual savings of 321 million euros from the reduced travel time. The Hyperloop will also connect the city centers with the airports, a trip of 10 minutes. Todays travel options between the two capitals are about 3-4 hours by air, including airport tranfers and time spent at airport or an overnight cruise-ferry crossing. These are the results of the world’s first pre-feasibility study of a full-scale Hyperloop system produced by US-based technology specialist Hyperloop One, consultants KPMG and Finnish company FS Links. FS Links was founded a year ago to facilitate the building of a fixed link between the two Nordic countries. An entire region of 5 million people would become a metro network, lifting property values and productivity along the route. Key to these plans is the Finnish city of Salo. The city, located 115 kilometres from Helsinki, has signed a ‘letter of intent’ with Hyperloop One to become the first test station along the proposed Helsinki-Stockholm route. 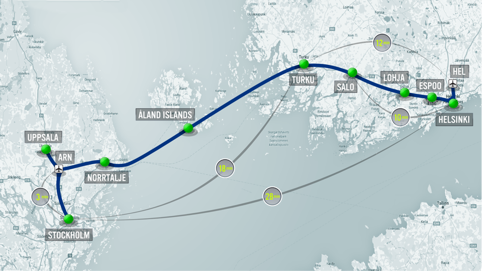 Salo officials believe the super-fast connection would be a great opportunity for growth and new jobs in the high-tech city. The next steps in FS Links and Salo’s plans are to find partners to fund the public-private initiative (the total cost is estimated to be 19 billion euros) and then secure a final agreement with Hyperloop One. There are still many things that need to be solved. But the pre-feasibility study shows the connection between Stockholm and Helsinki is not impossible. The challenges appear to be funding and execution. While the proposed Helsinki-Stockholm route could take 12-15 years to build, a fast way to transport goods would open up completely new business opportunities, while people could quickly and easily commute from one country to another. PwC just published a report Cities of Opportunities 7. The report measures 30 cities across 10 indicator groups and 67 variables. The report ranks Stockholm as the seventh best city in the world and the only Nordic city in the report. The world’s best City of Opportunity according to PwC is London which scores high in economic clout, intellectual capital and international accessibility. However the report was compiled before the Brexit referendum. Experts at PwC also warned there were risks Brexit could impact London, possibly hitting recruitment, trade and regulation, although they said it was too early to gauge the effect. London’s closest rival was Singapore, followed by Toronto, Paris, Amsterdam and New York. Stockholm is the champion of sustainability and environment as well as infrastructure. Among the cities in the report Stockholm also has the smallest income inequality. Though Stockholm generally evaluates well, the city is pulled down in the ranking because of the housing shortage and its relatively expensive living costs. Do you want to set up your business in one of the most innovative regions of the world? Welcome to Stockholm, where start-ups flourish. Feel free to contact Scandicorp who will happily provide you with any help and information. A small Finnish bank, Ålandsbanken, based on the autonomous Åland Islands but with offices in Finland and Sweden, is launching a new credit card to combat climate change. This new Baltic Sea Credit Card is made completely of renewable raw materials, is non-toxic and is biodegradable but that is not all: Card users will get an environmental report in their mobile app or internet bank account, effectively tracking the carbon footprint of their consumption. The bank hopes that increased transparency will contribute to changing daily habits to become more sustainable in the long run. The environmental calculations of the card are based on the Åland Index developed by the Ålandsbanken. The index works on the basis of a category code provided by retailers to Mastercard enabling a value for the carbon footprint to be calculated on each transaction. Catella is a leading specialist in property investments, fund management and banking, with operations in 12 countries across Europe. Catella recently published a Nordic Market Tracker. The Northern European property market is increasingly featuring in the pan-European real estate portfolios of institutional investors. Compared with other European countries, the economic transparency and prosperity of the markets in the Nordic countries makes them a popular option. Also, the availability of capital opens up new investment opportunities. Catella foresees these opportunities, especially for investments in the office and retail markets. In general, some 90% of invested capital in the Nordic countries is based on domestic markets (Sweden, Denmark, Norway and Finland), with a high share of Swedish capital – but this will change. Demand from German, French and UK investors rose in the past three quarters, not least through pressure from capital markets to look for a stable income stream. “Many markets offer clear potential for portfolio diversification. Copenhagen and Helsinki display a correlation that is slightly negative, as does Berlin. Stockholm’s correlation is below the level identified, for example, for the German cities of Cologne and Dusseldorf, and also from the perspective of Lisbon, Warsaw and London investors. Against this backdrop, combining a Nordic segment with a German, Spanish or Belgium office property segment could be a successful strategy for anyone interested in risk diversification,” explained Dr. Thomas Beyerle, Head of Group Research at Catella, talking about the investment strategy from an international perspective. The London-based think tank, the Legatum Institute, has again released its annual global Prosperity Index. This year’s index ranks Norway as the most prosperous country among 142 countries. The index compares 89 variables including traditional indicators like per capita gross domestic product and the number of people in full-time work in addition to factors such as number of secure internet servers in the country and how well rested people feel on a day-to-day basis. The variables are then split into eight sub-indexes: economy, entrepreneurship and opportunity, governance, education, health, safety and security, personal freedom, and social capital. Norway has topped the Prosperity Index for the last past seven years. Norway is the only country ranked in the top 10 of every sub-index. Denmark 3rd, after Switzerland (2nd), and second best when it comes to entrepreneurship and opportunity. Sweden 5th, after New Zeeland (4th), ranks the best for entrepreneurship and opportunity and also fares well in safety and security. The country gained one place in this year’s index. Finland 9th , ranked the third best in safety and security and fifth best in governance, however, the relatively poor economy has pushed the country down a rank from last year. Iceland 12th , dropped a rank compared to last year, but ranks in the top five in three sub-indexes; personal freedom, entrepreneurship and opportunity and safety and security. Would you be interested in expanding your business into this prosperous market? Yesterday the Swedish government submitted a proposal to the Parliament for a tonnage tax system that allows Swedish shipping companies to operate under competitive conditions similar to other countries in Europe. The aim of the government is to increase the competitiveness of the Swedish merchant fleet and increase the number of Swedish flagged vessels. “Tonnage tax has been eagerly awaited by the business community and I am pleased that we will now have a system of tonnage tax in place. I look forward to seeing more Swedish flag vessels.” says Magdalena Andersson, Minister for Finance. Tonnage tax implies that the taxable income of qualified shipping operations are determined at a flat rate based on the net tonnage of the vessels, regardless of income and expenditure. One of the benefits of a tonnage tax system is that the tax matters will be less important for a shipping company’s investment decisions. Tonnage tax will be optional. Shipping companies who wish to enter the tonnage tax system rather than being taxed conventionally will have to apply for tonnage tax in advance. An approval for tonnage tax will be valid until further notice. The company may as a rule, leave the system at the earliest after ten fiscal years. The new provisions would enter into force on 20 July 2016 and applied for the first time for fiscal years beginning after December 31, 2016. One condition is that the European Commission approves the proposed rules.